These HSF collaboration Roundtables were held in Cape Town and Pretoria respectively. The theme was the same for both discussions – an examination of the work of the Electoral Commission in preparing for next year’s national and provincial election (NPE), with further contributions from civil society organisations. 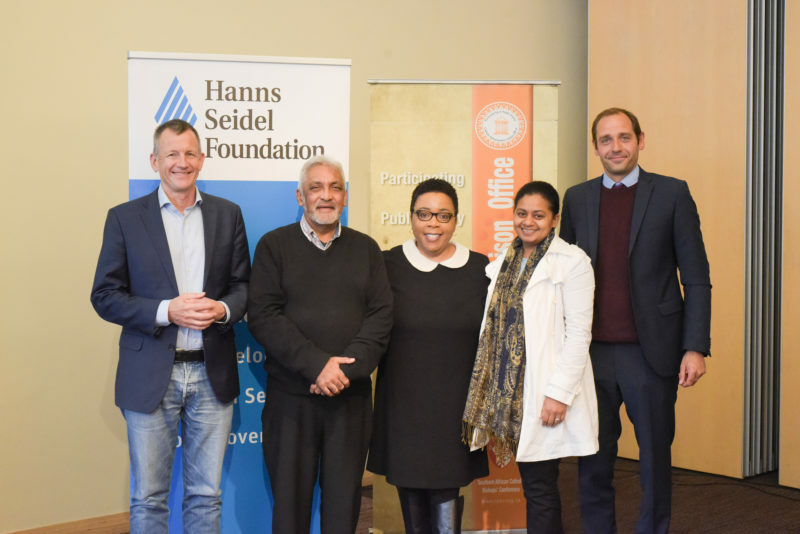 The speakers were Dr Nomsa Masuku, Deputy Chief Electoral Officer; Dr Jakkie Cilliers, Chairperson of the Institute for Security Studies; and Ms Janine Ogle, National Director of the advocacy organisation My Vote Counts. The Pretoria meeting was co-hosted by the ISS. In addition to the main speakers, Mr Hanns Bühler of HSF gave a short presentation of the foundation’s ‘Civics Academy’ online voter education programme. Dr Masuku gave a very comprehensive presentation, but noted that the Commission does not consider itself to be ‘ready’ until the election has been successfully conducted. Instead, it is ‘on track’ to carry out its mandate as specified in the Electoral Act and the Constitution. Among the key points she made were that almost exactly 75% of eligible voters (entitled by age and citizenship to vote) had registered; proportions were highest in Limpopo and the Eastern Cape, and lowest in Gauteng and the Western Cape. There was also a slightly lower rate of registration among youth, especially the 16-18 cohort. Countrywide, slightly more women than men were registered. Dr Cilliers focused on the security aspects of the election. He noted that there was usually more violence associated with local government polls, since numerous councillors relied on their municipal seats for an income and for opportunities for material benefit through corruption. This tended to make the stakes higher. In recent years, election-linked violence was concentrated in KwaZulu-Natal and Gauteng, and this pattern would probably continue. It was likely that a large security force operation would be instituted – as it had been in 2014 – in order to supress any violent outbursts before and during the elections next year. Ms Ogle focused largely on legislative reforms to party funding. She warned that there was always a tendency for politicians in government positions to use public occasions – and sometimes public money – to advance party interests at election time. There were examples of both the ANC and the DA having done this. She also raised concerns that the new Bill to regulate party funding, which had been passed by Parliament, had not yet been signed into law by President Ramaphosa. Some people were of the opinion that he was under pressure from political parties to delay doing so until after the 2019 elections.